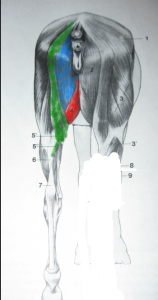 This is the third post in the series about groin muscles, based on a seminar at the AERC convention presented by Dr. Marcello. If it’s minor and hard to find do we still care? YES. From human data we know that even minor groin injuries are hard to rehabilitate. In fact, veteran hockey players have 5x groin injury rate than rookies – perhaps suggesting that if you are doing sports prone to these injuries, perhaps accumulate over time, and are difficult to completely heal? Groin injuries are divided up into classes (I, II, III). Classes are assigned based on the amount of pain the (human) patient is experiencing, and what they can see on various diagnostics. Grade 1: mild discomfort. 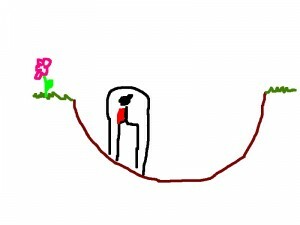 For humans this means “when I step off it hurts, but then I push and it doesn’t hurt”. In our horses, this means that there is often no lameness associated with this class of injury. There may or may not have a tight or tense muscle in that group of muscles that we discussed in an earlier post. Grade 1 injuries are hard to find. For both the rider AND the vet it is important NOT turn a mild grade 1 into something worse. It’s hard to see, it’s hard to diagnose – but you haven’t done your horse any favors if you make it worse and turn it into a grade 2 or 3!!! Grade 2: sharp pain/discomfort in inner thigh. It often takes 12-24 hours for tightening and swelling to show up. In our horses this means that they could look fine immediately post ride, but show up with an injury some time in the day after the ride. Horses look normal at the walk, lame at the trot and usually bring their hind leg closer to midline during the trot to try and minimize strain on that inner thigh group of muscles. Grade 3: Noticeable/severe pain on occurence. This can manifest with sudden lameness after a fall or other trauma. Usually we can actually see a hematoma or fluid on the ultrasound. 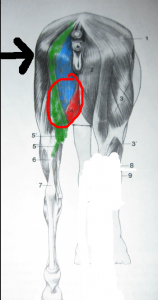 Besides acute trauma from a fall or a stupid pasture antic, there are other ways we can overstress the groin muscles over time and cause injury……Here’s a couple of endurance specific ones that Dr. Marcello mentioned in his presentation. 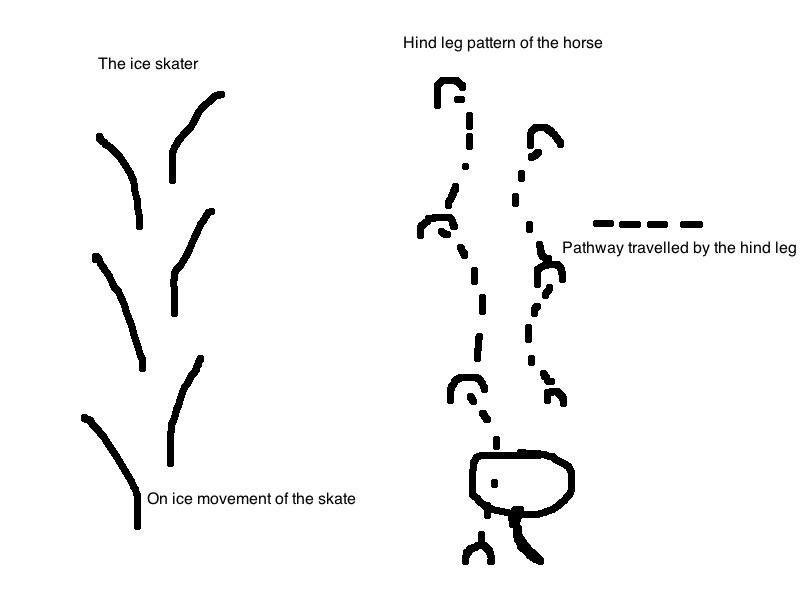 Turns out that the way that both the hind legs of horses move and the way ice hockey players skate (inside toe, slight outside push) creates forward pulpulsion, hip movement, and works the abductors and adductors (outside and inside muscles of the thigh) unequally. In humans, this unequal work (and strength gain) increases the risk of groin injury. Besides minimizing all those factors listed above that overstress the groin, can we minimize this risk by conditioning our horses in a certain way? Back to the human statistics, it turns out that STRETCHING makes no difference. Stretching does not PREVENT or TREAT groin injuries. This work needs to be kept SHORT. Don’t do this when you are planning on going out on a long ride. Don’t do it when the horse is already fatigued. Don’t do it until your horse’s muscles are trembling from exhaustion. 10-15 minutes of focused work and then quit. This sort of work is perfect to do when you don’t have a lot of time! Very soon we will talk about the mTOR pathway and why, if you are trying to build muscle, you should separate your muscle building exercises from your longer endurance training. Consider doing this sort of work separate from your regular long training days. Injuries can be acute and traumatic, or they can be more chronic injuries of the muscle tendon unit. Depending on the “grade” the injury could be more or less obvious and ultrasound may or may not show anything. The horse may or may not be lame. Maybe he’s just not moving “quite right”. Dr. Marcello said that most cases had vague complaints in specific circumstances – they aren’t always lame! If you don’t have a thermography camera (totally coveting this little gadget by the way…..) there’s a way to see whether there is an underlying groin muscle issue behind the “NQR”. Dr. Marcello called it “the function test”. The idea behind the function test of the groin muscles is to isolate those muscles and see if they can perform normally without pain. 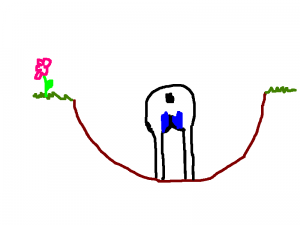 Dr. Marcello had videos to show this “function test” and I would be more than happy to show you what it looks like in real life if you catch me at a ride. However, in this blog I’m going to show you the theory behind test and explain why it works. 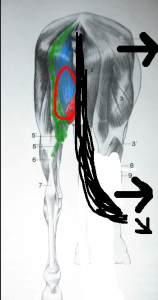 Let’s return to our nicely colored diagram that shows off the muscles we want to isolate and test whether they are functioning normally. The first step is to take the opposite hind leg out of the equation. 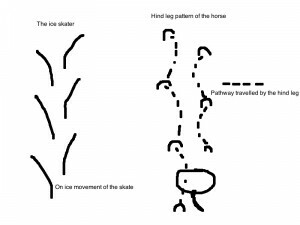 In my diagram I used my handy eraser to erase the lower right hind leg. In real life you would pick this leg up at a level that is comfortable to the horse – this isn’t a flexion test, you aren’t pulling it – you are just trying to remove it from the ground so that the horse can’t use it to stabilize itself and has to use the left hind. Imagine if you are holding the left hind leg in a neutral position off the ground and you reach up with one hand and push on the hip away from you (represented by the black arrow). The horse’s balance is going to shift towards the left, and to counteract the pressure on the left hind, the muscles on the OUTSIDE of the thigh are activated to help maintain balance. 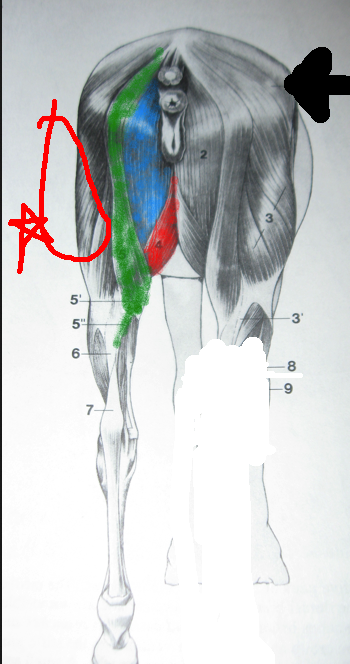 To activate the muscles of the INNER thigh (groin) the horse needs to be pushed off balance TOWARDS the side you are holding the leg. How can you accomplish this. While it is true that you could have someone else on the opposite side pushing the hip towards you – this is unnecessary (and probably unsafe, not to mention as a vet you don’t always have a assistant, AND since this test will be repeated on both legs to compare the response I want to make sure that the pressure is applied the same way with the same force, so I want to be able to do the entire test myself to reduce variability). You can use the horse’s TAIL to move the pelvis towards the hind leg that is lifted. The tail is passed under the point of the hock, and without pulling the leg outward, the tail is pulled to apply pressure that shifts the horse’s balance towards the right, and engages the muscles on the inner thigh of the opposite leg (the groin). 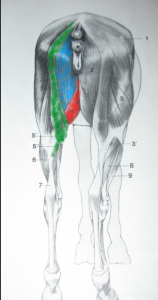 Depending on how the horse responds, this “function” test can help isolate whether the groin muscles are a source of discomfort. These were the main points presented about the groin. Any questions? There was some discussion on the pectoral region injuries – however there wasn’t a lot of data, the test is less straight forward, and I didn’t find the presentation as convincing, which is why we focused on the groin muscles here. (80% of the seminar was on the groin during the convention). 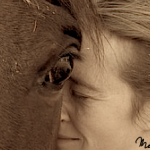 Michael Beesley’s book “Equine Performance Therapeutics” was highly recommended and Dr. Marcello worked closely with Beesley before he passed away recently. I was not able to find a good source on the internet for the book, but would be HIGHLY interested if anyone was able to find a source………. Fascinating! Thank you so much for writing all this up! No I don’t – Most of the time it seems to be an ingrained preference – but a sudden change is always worrisome.